Recess is an important part of the school day for every child. Every class has a morning and lunch recess, which translates to an hour outside each day. Recess provides a time for children to exercise, play and practice important social skills. How do you organize a game? Make sure it’s fair? Agree on the rules? Today, children lead very structured lives. Their extra-curricular activities leave little time for free play. Recess helps them learn to be creative and entertain themselves without electronics or adult input. The sand box becomes a restaurant, an island with buried treasure, or a canal with a windmill powered by the water pump. Variations of four square, soccer, and kickball are developed. While there is plenty of supervision during recess, children are encouraged to work things out for themselves before asking for help. When they can’t, teachers help them take a step back, hear each other’s point of view, and develop a compromise. 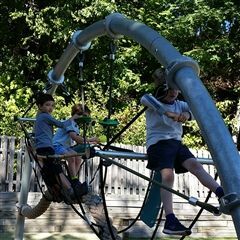 Recess is a change of pace from academics, but it is not a suspension of learning.